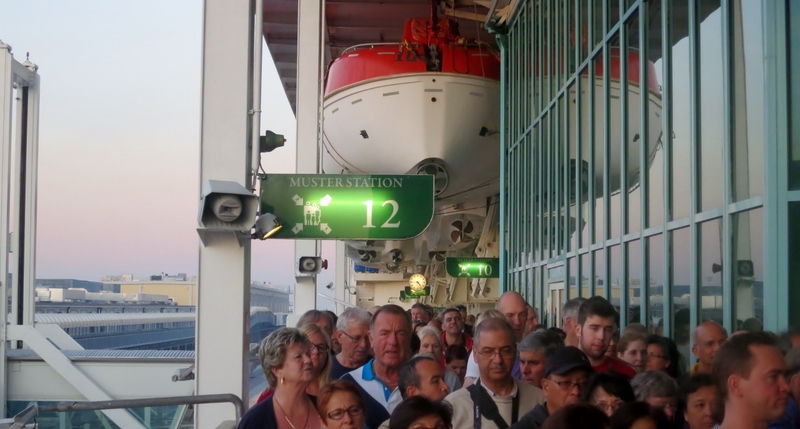 We arrived at the Splendour of the Seas at 3:15pm - a 'quarter before closing time' - but we were definitely not the last to arrive! We got an aft cabin - larger than normal cabins with a balcony much bigger - a really nice cabin. See review of the cabin i newer post (not published yet). Immediately after we had boarded was the 'Muster drill' where we had to go to our lifeboat at deck 4 (picture) and get instructions on life jackets and lifeboats. Back in the cabin we enjoyed the last sun on the balcony - weather was really nice with sunshine and 20 degrees. At 6pm we sailed from Venice - a spectacular sight as we passed St. Mark's Square - video below. At 7pm we went down for a drink in the lounge and at 8pm we got dinner in the Chops Grill - one of 'specialty restaurants' - which was a welcome aboard deals. A nice dinner.